Tamarack: The Best of West Virginia is the nation’s first retail showcase of handcrafts. 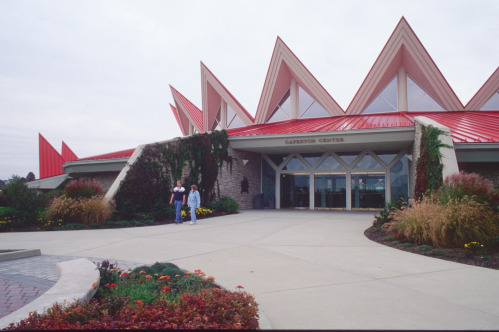 The building’s striking peaked red roof and attractively landscaped grounds draw half a million visitors annually off I-77 and I-64 into a welcome respite of visual beauty, Appalachian sounds and distinctive aromas. A one-stop-shop for West Virginia culture, heritage, handcrafts, fine art, regional cuisine and music, Tamarack employs a rigorous jurying process that ensures product quality and authenticity. Resident artisans work daily in observation studios to demonstrate textiles, wood and pottery. The fine art gallery offers a glimpse of the current art scene and a breath-taking view of eclectic creativity. Mixed media collections change regularly. Gallery openings, which are free to the public, allow the artist to meet and greet visitors. Art on display and works matted without frames are available for purchase. Throughout the year, artisan demonstrations and food tastings engage visitors in new experiences. Tamarack, in concert with its world-renowned partner The Greenbrier, provides signature dining which attracts guests for helpings of delectable cuisine. The special menus are an anticipated feature of the “Taste of West Virginia Food Court”, as well as catered special events and meetings in the Tamarack Conference Center. "Sunday @ Two", Tamarack welcomes live performances in the intimate Governor Hulett C. Smith Theater featuring live music, theatre, dance and storytelling performances. "Sunday @ Two" is a free feature. Tamarack is located off I-77/I-64 at Exit 45 and is open daily 8 a.m. until 8 p.m., March 13th through January 1st, and 8 a.m. until 7 p.m. January 2nd through March 12th. For more information or to browse Tamarack’s online store go to http://www.tamarackwv.com/ or call toll free 1-88-TAMARACK. *Information courtesy of Tamarack Visitor’s Guide.